Not only is foot pain an annoyance, but it can impede you from enjoying your daily life. As you may already know, foot pain strikes right after taking your first steps in the morning and can continue until the very end of your day. So, if you are looking for foot pain shoes in Santa Ana, keep reading. We at Lucky Feet Shoes, have a comfort shoes store conveniently located in Santa Ana, for your walking shoes, running shoes, comfort shoes, wide shoes, and arch supports. Vist us, as we can help you eliminate or reduce your foot pain with some of best comfort shoes on the market! Know that, wearing comfortable and supportive shoes can help you conquer that pain! 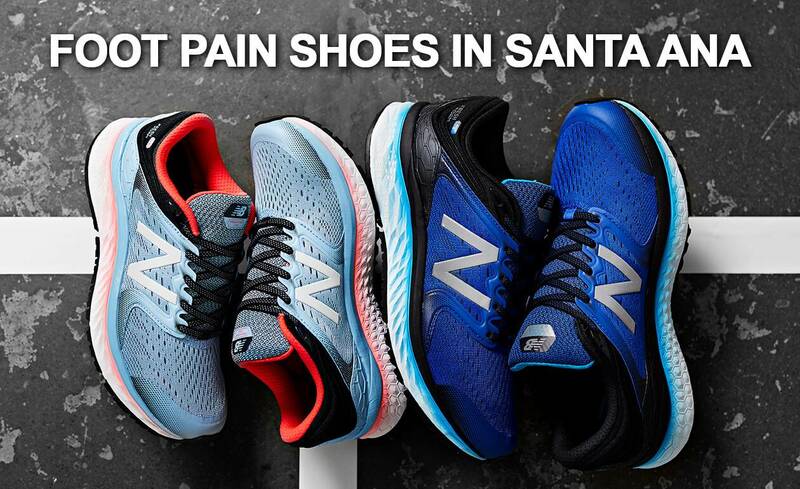 You have come to right place for most comfortable pain shoes in Santa Ana, CA. At Lucky Feet Shoes, our goal is to offer the residents of Santa Ana healthy shoes for heel pain, back pain, arch pain, and foot pain. We are proud to say that Lucky Feet Shoes is not your typical shoe store; we offer a wide variety of comfort shoes, wide shoes, walking shoes, arch supports, running shoes, custom orthotics and much more. Not only do we offer a wide variety of women’s comfort shoes and men’s comfort shoes; but at Lucky Feet Shoes, you’ll receive a FREE FOOT ANALYSIS by a trained pedorthist. If you are experiencing any sort of foot pain, we encourage you to visit any of our stores for your FREE FOOT ANALYSIS. A Lucky Feet Shoes trained pedorthist will study your gait (the way you walk), measure your feet, and perform a digital pressure mapping system for a complete foot analysis. They will continue to evaluate your feet in order to understand your specific needs, foot pain, and any foot problems that may be causing your foot pain. So, schedule your FREE FOOT ANALYSIS appointment and let us help you find comfortable foot pain shoes in Santa Ana! Not only do we serve customers with foot pain shoes in Santa Ana, but we also serve Orange, Tustin, Irvine, Costa Mesa, Santa Ana, Newport Beach, Huntington Beach, Fountain Valley, Fullerton, Villa Park, Santa Ana, Garden Grove, Buena Park, and many more! Our comfort shoe stores are staffed with professional pedorthists who are trained to find the best footwear for your individual needs. Visit us at Lucky Feet Shoes in Santa Ana to find out why our customers keep coming back! We’ll help find the best foot pain shoes in Santa Ana.